Genuine Purling of London product. High quality leather covered bases. A beautiful modern take on a classic design. Purling of London should need little or no introduction. An innovative UK-based company that took the bold step of creating a modern contemporary product from a design that began life in the mid 1800s. It's probably no coincidence that both this version, and the original started life in London in the UK. It didn't surprise us that this classic red and shadow black was one of the top selling Purling products. It's all about the colours of course and this one is a certain favourite. 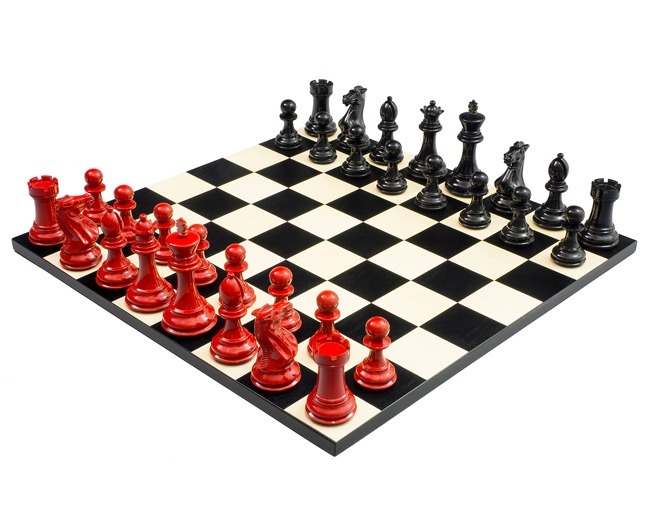 This lovely set is part of the Bold Chess range of products and as the name suggests, features strong, bold colours that are certain to get this set noticed in your home. Its distinctive and sophisticated aesthetics are a perfect match for even the most modern interiors. The chessmen are all expertly crafted and have been painted, lacquered and polished to a high gloss. The contemporary look and feel is continued with the simple, minimalist board at just under 18 inches (45 cm). A truly amazing chess set and collector's item.